Blood Axis is an American Neofolk/Post-industrial band consisting of journalist and author Michael Moynihan, music producer Robert Ferbrache and musician and author Annabel Lee. Moynihan had founded Coup de Grace, a multimedia project that produced live performances and cassettes and also released booklets of images and texts, the last of which was Friedrich Nietzsche's The Antichrist. The first output from the new appellation were two songs, "Lord of Ages" (employing lyrics from Rudyard Kipling's poem on Mithras) and "Electricity", which appeared on a German music sampler. These tracks were well received in Europe and were followed by two more songs that appeared on the compilation, Im Blutfeuer. In 1995, Moynihan released the first full-length studio LP, The Gospel of Inhumanity with the help of Robert Ferbrache. The album wedded the music of Johann Sebastian Bach and Sergei Prokofiev with modern electronics. Moynihan implemented a recording of Ezra Pound reading from his The Cantos. He also included lyrics from Nietzsche and Longfellow  as well as his own to the work. The band consisted of Michael Moynihan (vocals, bodhrán), Annabelle Lee (melodeon, electric violin) and Robert Ferbrache (guitars, keyboards). Lee and Moynihan comprise the musical group, "Blood Axis." Lee translates books and articles, which include those by Christian Rätsch and Julius Evola. In 2005, Blood Axis play the German Flammenzauber festival, showcasing reworked live versions of several previously released songs, an amount of Irish folk songs and the live debut of a few new songs. April 2006 saw further live activity from Blood Axis, as well as a new medium for the duo's folk-oriented material entitled Knotwork at the Swiss Triumvirat festival. Beginning in 1998, Moynihan began saying that Blood Axis was at work on a second full-length album, at one time said to be entitled Ultimacy. On 2 January 2009, Blood Axis played in Sintra, Portugal, with members of Portuguese band Sangre Cavallum. Moynihan stated on stage that the new album, now titled Born Again, was to be released the following Easter. CD and 2xLP. Released by Cthulhu/Storm. CD rerelease on Elfenblut/Misanthropy/Storm in 1998. CD rerelease with deluxe packaging on Tesco Distribution/Storm in 2001. CD and 2x12" LP limited to 600 copies. Released by Cold Meat Industry. Split 7" EP with Allerseelen. Released by Storm Records. Split 7" EP with Allerseelen. Released by Stateart. Collaboration with In Gowan Ring. Privately released CD-R.
Collaborative CD with Les Joyaux De La Princesse. Released by Athanor. Collaborative 2x10" LP box with Les Joyaux De La Princesse containing remixes of Absinthe: La Folie Verte. Released by Athanor. 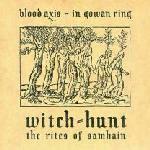 Witch-Hunt: The Rites of Samhain is a recording of a 1999 live collaboration of Blood Axis and In Gowan Ring, performing as Witch-Hunt. The album was not released on a label. Limited to 100 CDR copies for private distribution, it was sold only at select Blood Axis concerts in Portugal. The album came in a special hand-made fold-out sleeve with leaf. ^ the album notes read "The Gospel of inhumanity was [...] entirely performed, recorded and engineered [...] by Michael Jenkins Moynihan and Robert Ferbrache". ^ Pound, Ezra. "The Cantos"
^ Longfellow, Henry Wadsworth—The Challenge of Thor"; Pitt; . ^ Blood Axis Bio Archived July 26, 2011, at the Wayback Machine; Tesco Records on line; retrieved . ^ *Christian Rätsch, Claudia Müller-Ebeling. "Shamanism and Tantra in the Himalayas" (transl. Annabel Lee) (Rochester, VT: Inner Traditions, 2002). ^ from the interview for the Heaven Street magazine, Issue 3, spring 2006, available on-line on Heaven Street website. "The March of Brian Boru"
This page was last edited on 9 October 2017, at 16:14 (UTC).